The recognized smoothed price fluctuations are not lagging in time relative to the source series as opposed to MACD, which uses moving averages. Accordingly, this indicator has solved the MACD problem of lagging to more accurately and synchronously reflect the variability of the price series behavior. The resulting forecast for the identified "fast" and "slow" price fluctuations takes into account the aggregate analysis of various detected factors, which form the "wave" behavior of the data series, and it can be used to reduce risks in a strategy. The characteristic behavior, as well as the signals and interpretation of the indicator correspond to the same properties of the linear MACD. N: Data fragment — the length of the analyzed price series. Time-dependent lag — determines the window of data "influence" (N/2, ..., N/4). 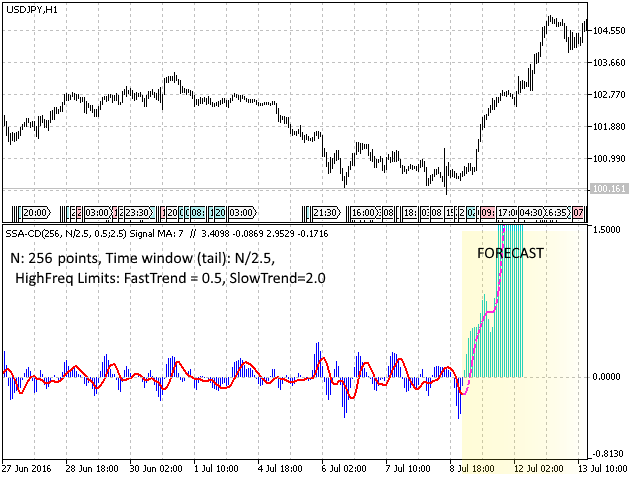 FastTrend high-freq. limit — a filter parameter for identifying a fast oscillating equivalent of the MA. 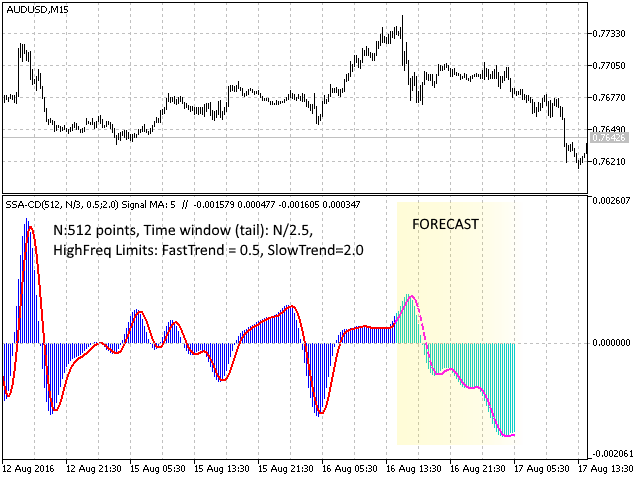 SlowTrend high-freq. limit — a filter parameter for identifying a slow oscillating equivalent of the MA. Signal SMA period — the smoothing period of the difference between the fast and slow moving averages. Data preparation — the method of preparing data for the analysis. Forecast preparation — the method of preparing data for the forecast. 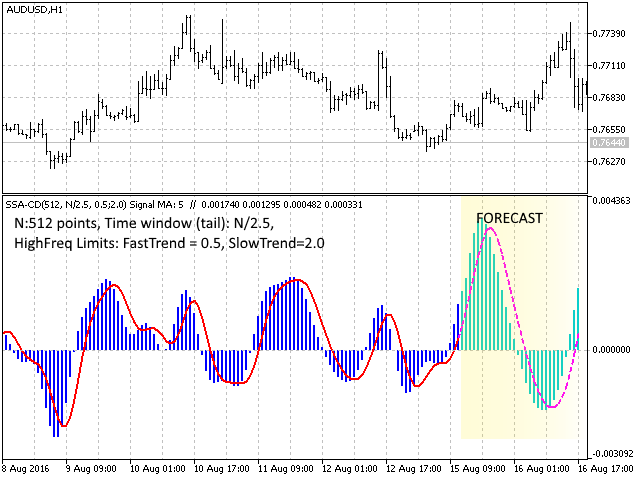 Forecast smoothing — forecast smoothing method. Forecast рoints — the number of prediction points. Backward shift (testing) — a shift of the analyzed fragment deeper into the history. 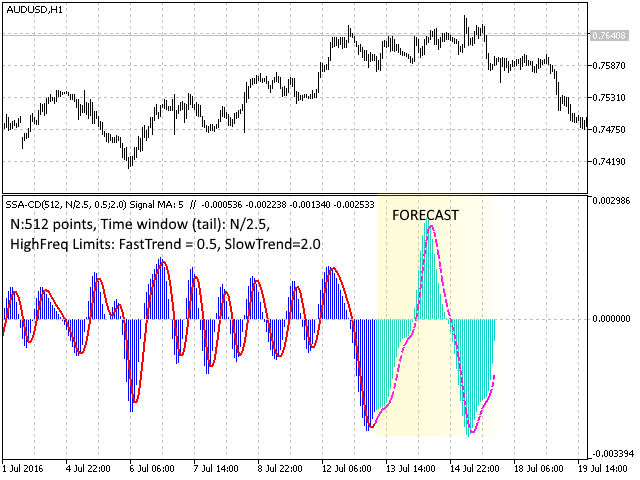 Configuration of the model and forecast based on known data. Magic Number — identifier to connect to the EA. (H-S)%max: Buy support signal — validity level of the buy signal (in % of the maximum). (H-S)%max: Sell support signal — validity level of the sell signal (in % of the maximum). The influence window limits the number of past points which affect the current price. A reasonable value if s = 1 or 2. High frequence limit for defining MAs indicates the weight of the high-frequency noise in the total variance of the price series (in percentage). For the fast oscillating MA it should be equal to 0.5 - 1.5, for the slow one 1.5 - 4. All oscillations, whose weight does not exceed this level will be filtered out. 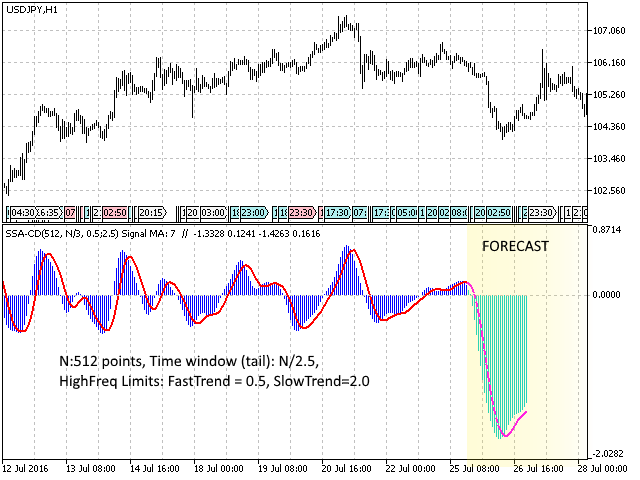 BacwardShift shifts calculations along the price series in order to compare the forecast with the known prices and to select the indicator parameters. 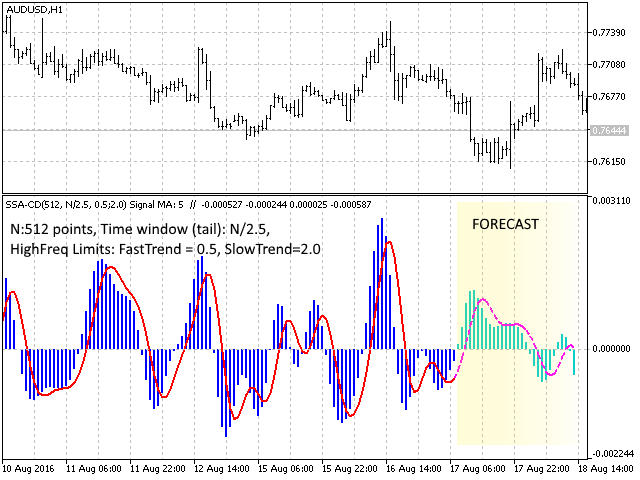 Data preparation - modification of the price series for another sequence in order to improve the forecast result on a certain timeframe. P.S. 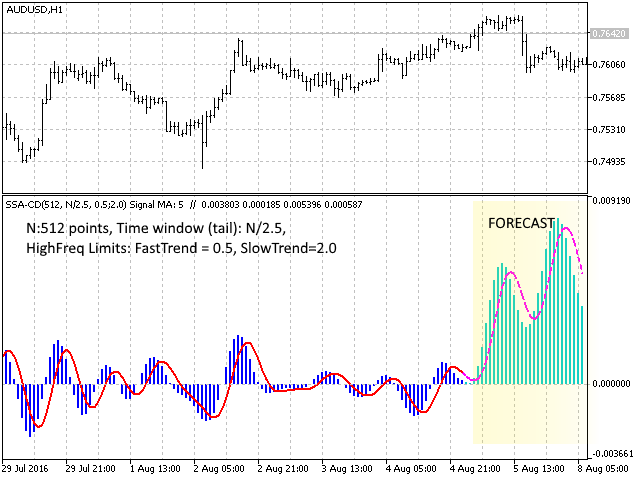 Trend visualization along the price chart is available using the SSA Trend Predictor indicator. 1. Added auxiliary "validity" signal, which displays the breaking of the "noise" level. 2. Provided the ability to smooth the forecast according to significance of the forecast values obtained earlier. 3. Provided the ability to connect to the EA by requesting the buffers 6 and 7 of the indicator.